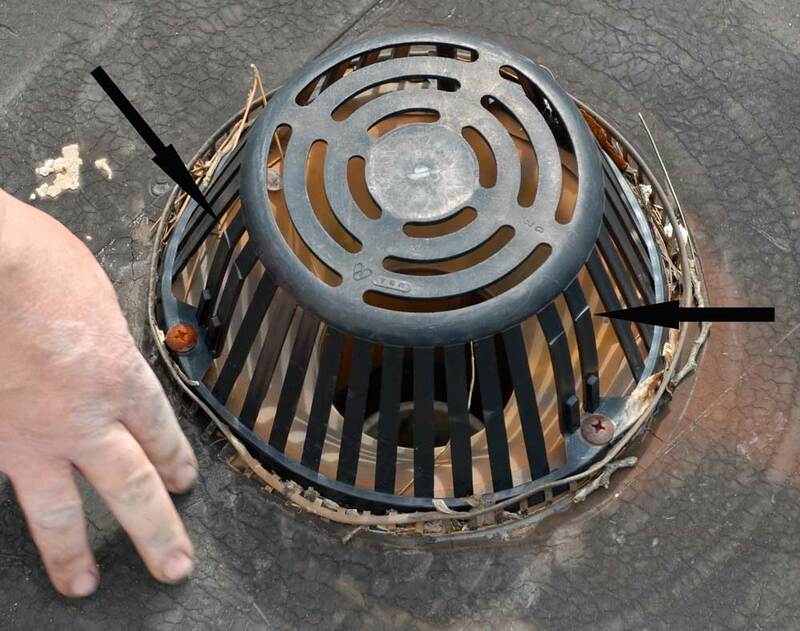 The easiest improvement you can make to your flat roof is to replace the small plastic strainer or grate with a self-made larger strainer that is metal. The sizes shown below prevent small debris from going down the drain with the water. Eventually, the build up of debris will hold back the flow of water. 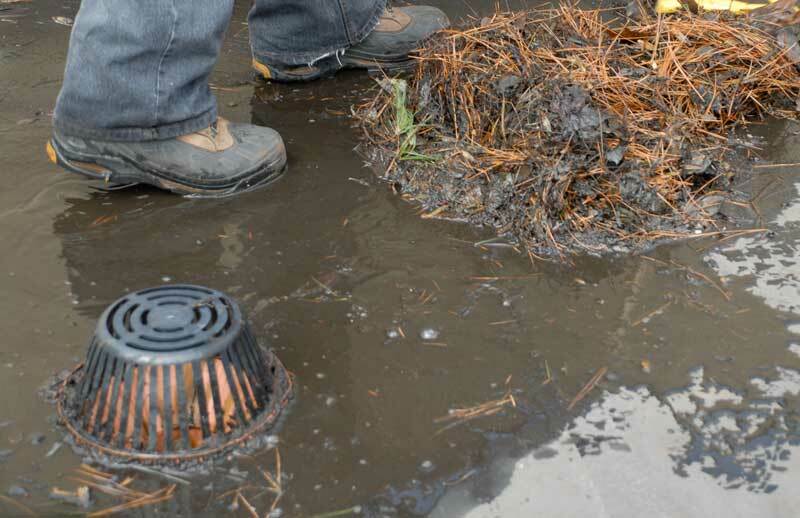 Standing water can promote the growth of moss and also become a breeding ground for insects and mosquitos. Visit a metal supply yard or a metal scrap yard and look for a mesh type of sheet metal. Have it cut to about 24″ x 24″ and have the four sides bent to form 2″ sides all around. The sturdier the mesh the better it will perform. Just making a large strainer from either diamond mesh or any other wire mesh material will improve the drainage system. Make sure the holes in the mesh are big enough to allow small debris through. 1″ x 1″ holes will be better than 1/2″ holes. This video explains the principles of how a large metal strainer will be more practical than smaller dome shaped plastic strainers. A plastic strainer for a flat roof drain is not a good idea. They become brittle and break. Pittsburgh, Monroeville, Stamford, Greenwich, White Plains. If you are more serious about ensuring proper drainage, then lowering the drain is another option. This is by far is the best way to make sure that your drains are doing the job they are meant to do. Although a professional roofer will need to be called to make the adjustment, you will be saving money over time; the installation of a new roof can be far more involved and costly. 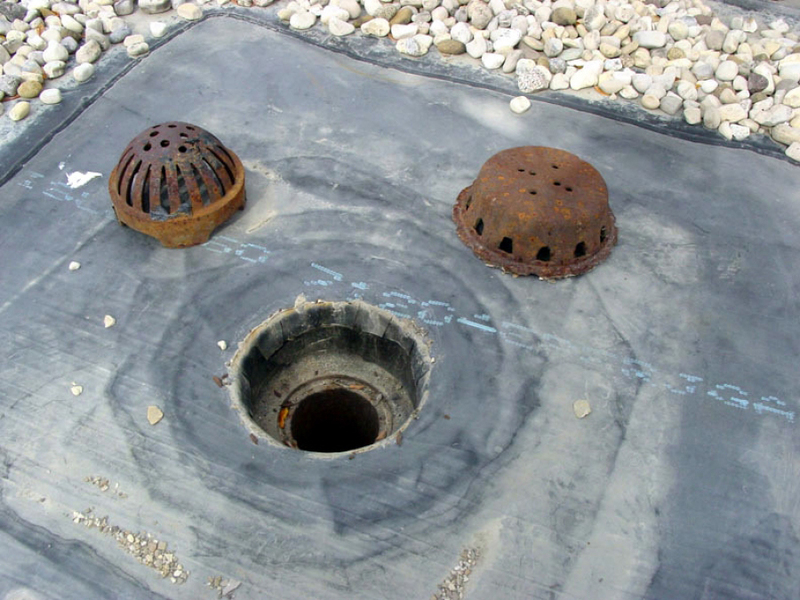 Below is a list of considerations that will determine the cost of lowering a drain. What type of membrane is on the roof? Are there other roof systems under the current membrane? Do you need to get a plumber to shorten the piping from inside? Do you need a carpenter to cut and lower the roof deck in that area? A reputable and experienced roofing contractor will be able to do everything without having to get other tradesmen involved. The cost of lowering a drain can start as low as $1200 and cost as much $2500. It all depends on the circumstances. This is a video on how we lowered a drain. We have built recessed drains for over 20 years now. None of them is as good as the one in the video below. Watch this video to see how well this system drains the water off the roof. After 10 years the owner did not know he had to clean the debris off his roof. He took it for granted that the drains just work. Amazing to find out that the drain had prevented a disaster over the years.